Assistant Professor Silvia Perez-Cortes holds a PhD in Bilingualism and Second Language Acquisition from Rutgers University, New Brunswick. Her research interests lie in the areas of bilingual language acquisition and education in language contact situations. Dr. Perez-Cortes is particularly interested in analyzing the grammatical development of heritage populations (both children and adults) with the objective of exploring how syntax and the lexicon are accessed and represented in the bilingual mind. Her most recent investigations examine the acquisition and restructuring of interface properties including tense, mood and determiner use by early and late Spanish/English bilinguals. Putnam, M., Perez-Cortes, S. & Sánchez, L. (Accepted). Feature Reassembly Hypothesis in Language Attrition Contexts. In Schmid, M., & Kopke, B. (Eds. ), Oxford Handbook of Language Attrition [Chapter 3]. Austin, J., Sánchez, L., Perez-Cortes, S. (2017) Null subjects in the early acquisition of English by Spanish Heritage bilingual children. In Perpiñán, S. (Ed. ), Romance Languages and Linguistic Theory 11. Selected papers from the 44th Linguistic Symposium on Romance Languages (LSRL), University of West Ontario (p. 209-227). Amsterdam/Philadelphia: John Benjamins. Syrett, K., Lingwall, A., Perez-Cortes, S., Austin, J., Sanchez, L., Baker, H., Germak, C., & Arias-Amaya, A. (2017). How Spanish-English bilingual children approach entailment-based scalar implicatures. Glossa Special Issue: Acquisition of Quantification. Syrett, K., Austin, J., Sánchez, L., Germak, C., Lingwall, A., Perez-Cortes, S., Arias-Amaya, A., & Baker, H. (2017). The influence of conversational context and the developing lexicon on the calculation of scalar implicatures: Insights from Spanish-English bilingual children, Linguistic Approaches to Bilingualism, 6(6), 1-25. Perez-Cortes, S. (2012). The Interpretation of Present Progressive aspectual features by L2 Spanish Learners and Heritage Language Speakers, Arizona Working Papers in SLA teaching, 19, 36-55. Perez Cortes, S. (2011). The Acquisition of idiomatic expressions through a Cognitive Linguistics-based instruction: a pilot study, Actas del IX Congreso Internacional de Lingüística General, Universidad de Valladolid, 21-23 Junio, 2010. García P.N. & Perez-Cortes, S. (under review). Heritage learners and the internalization of gramatical categories: A Vygotskyan approach to teaching and learning. Austin, J., Sánchez, L., Perez-Cortes, S. & Giancaspro, D.(under review). The development of inflection in child heritage speakers of Spanish learning English as a second language. In Martohardjono, G. & Flynn, S. (Eds. ), Festschirft in honor of Barbara Lust. The number of NJ residents that speak a language other than English at home has grown exponentially in the past 20 years. In Camden, for example, the percentage reaches a stunning 44%, where Spanish is undoubtedly the most widely spoken (with almost a 40%). 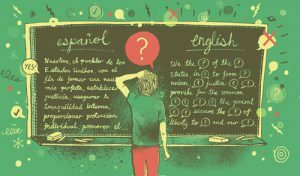 Despite the strong presence of multilingualism in the state and throughout the country, there is a lack of research studies focused on young Spanish/English bilinguals. How do both languages interact during the process of language acquisition? Up to what extent does the lack of support and input in the heritage language affect their linguistic development? In my research, I investigate these and another issues related to child language development in heritage populations. In this large-scale project I examine Spanish heritage speakers and second language learners’ acquisition of subjunctive mood using different types of experimental tasks: a truth-value judgment, two production tasks (written and oral), and an acceptability judgment task. Results show that accuracy is largely dependent on the interplay between participants’ level of proficiency (how high is their mastery of Spanish? ), age of onset of bilingualism (when were they first exposed to both languages?) and frequency of Spanish use (how often do they use the language?). Find more about Dr. Perez-Cortes’ work at: Researchgate and Academia. Page last updated by World Languages and Cultures at 10:15 am February 19, 2019 . This page was printed from http://foreignlanguages.camden.rutgers.edu/faculty/silvia-perez-cortes/ at 12:30 AM Monday, April 22, 2019.